The long awaited return of the NFL regular season is less than five weeks away and to get you ready for the games I will be taking a closer look at some of the top matchups on the slate for Week 1 of the NFL preseason. These exhibitions may not count in the standings, but you can still bet on the games with odds provided by BetOnline sportsbook. 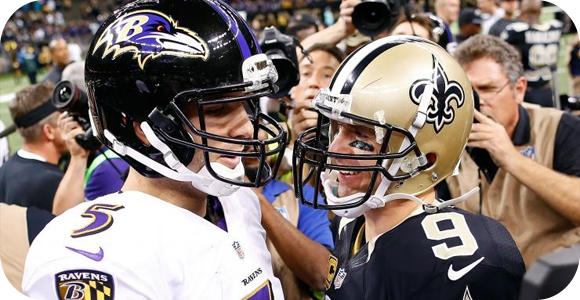 The Saints went 7-9 straight-up and 6-10 against the spread in the 2014 regular season. In Week 4 of last year’s preseason they lost to Baltimore 22-13 as three-point favorites at home with the total staying UNDER the closing 41.5-point line. New Orleans had gone a perfect 3-0 (SU and ATS) in its first three preseason games that year. The Ravens went a perfect 4-0 both SU and ATS in their 2014 preseason games before going 11-7 SU and 10-8 ATS in their run all the way to the Divisional Round of the playoffs. I like Baltimore’s chances to get off to a fast start again this year with a win at home that covers the current three point spread. This could be a preview of this season Super Bowl with Green Bay listed as a +300 second-favorite to win the NFC and New England listed as a +400 co-favorite with Indianapolis to repeat as AFC champs. The Packers lost their preseason opener last season before going 3-0 (SU and ATS) in their final three games. New England ended-up 2-2 both SU and ATS in its 2014 preseason run with the total staying UNDER in three of the four games. I am leaning towards the UNDER in this game as well with both head coaches much more focused on evaluating talent as opposed the actual score. This is another matchup of Super Bowl contenders with Denver listed as a +500 third-favorite to win the AFC and Seattle once again favored to win the NFC at +250 betting odds. The Broncos come into this preseason opener with 3-1 mark (SU and ATS) in its last four preseason games. The total stayed UNDER in all four contests. Seattle started its run to a second-straight Super Bowl appearance with a 21-16 loss to Denver in the preseason as a one-point road favorite. The Seahawks usually do not lose at home, but that is when the starters play the whole game. Take Denver and the generous spread of five points in this one. Kansas City finished the 2014 regular season 10-6 ATS with a 5-2 record ATS as an underdog; however it went 1-3 SU in the preseason with a 0-3-1 record ATS. Arizona was 11-6 (SU and ATS) last year in a run to the Wildcard Round of the playoffs which included a 6-2 record ATS in eight home games. The Cardinals lost three of four preseason games last season with a 2-1-1 record ATS. The total stayed UNDER in three of the four games. Defense is still the strong suit of both teams and each has done a good job adding depth in the offseason making this another good matchup to stick with the UNDER on a total line of 35.5. The betting public has been high on the Colts’ chances to take that next step this season all the way to Super Bowl after posting three-straight 11-win seasons. Last year they went winless in the preseason and failed to cover in three of the four games. The total was evenly split 2-2. Philadelphia could be the most intriguing team in the NFL heading into the new season with a complete makeover on offense. The Eagles went an even 2-2 both SU and ATS in the preseason last season with the total going OVER in all four games. Both of these teams know how to score points no matter which players are on the field so I am going with the total in this game as well with a bet on the OVER 42.